Arthur J. Ammann, MD, Clinical Professor of Pediatrics at the University of California, San Francisco, is the founder of Global Strategies, an organization dedicated to empowering communities in the most neglected areas of the world to improve the lives of women and children through health care. His pivotal research studies on vaccines resulted in the first FDA approval of a pneumococcal vaccine for infants, children, and the elderly. In 1982 Dr. Ammann described two of the three ways that HIV is transmitted: from mother to infant and from the transfusion of blood. He is the recipient of more than fifty national and international awards. "This is an excellent read for any individual desiring to examine an influential leader whose passion for justice in treatment of this epidemic drove many health promotion successes. Highly recommended." "Arthur Ammann, a veteran in the war against AIDS, has meticulously chronicled the history of pediatric HIV infection. In particular, he has critically examined the causes for the unnecessary delays in implementing best practices to block mother-to-child transmission of HIV in the developing world. This retrospective re-evaluation provides valuable lessons as we prospectively confront public health challenges, now and in the future." —David D. Ho, MD, Director, Aaron Diamond AIDS Research Center, was Time magazine Man of the Year, 1996. 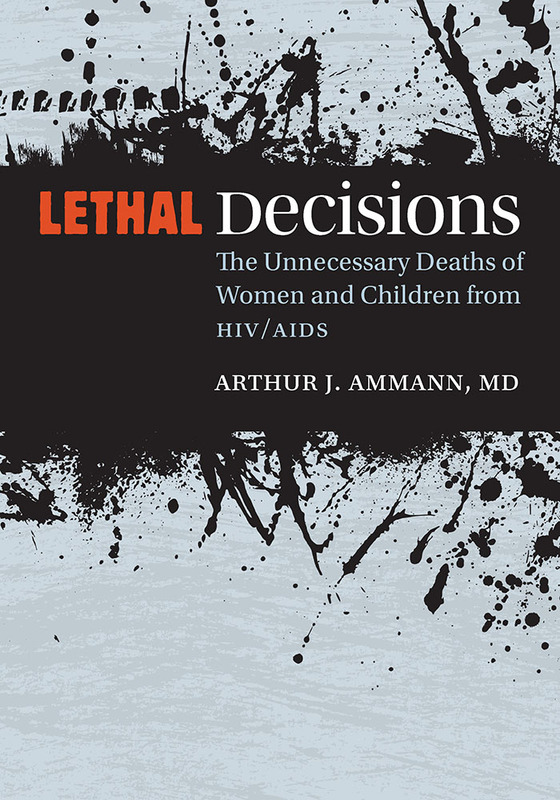 "In Lethal Decisions, Arthur Ammann traces the history of the pediatric HIV/AIDS epidemic from the early discoveries and extraordinary successes through the dark period of inexcusable delays in prevention and treatment. . . . He does not hesitate to point out that the large and powerful health organizations must be held accountable for their recommendations to withhold effective prevention and treatment measures from millions until HIV progressed to advanced stages of infection. Injustices and disingenuous attitudes toward women contributed to unequal standards of care, exploitation of research subjects, and the failure to recognize the synergistic relationship between violence against women and HIV. The book is a must-read for those who seek to learn from the HIV/AIDS pandemic how to navigate the intricacies and consequences of working with large bureaucratic organizations, established to protect women and children but too often failing to honor women's dignity and to ensure their equal access to health care." —Anne Firth Murray teaches international women's health and human rights at Stanford University. She is the Founding President of the Global Fund for Women and the author of From Outrage to Courage: The Unjust and Unhealthy Situation of Women in Poorer Countries and What They Are Doing about It. "The first reports of AIDS in infants and children were met with disbelief by many who had become convinced that AIDS was only a disease of adults. Dispelling that misconception and mobilizing the resources to understand and react to save the lives of millions of women and their children is the gripping story told in Lethal Decisions by Arthur Ammann, the pioneer in this epic quest. This is a vital contribution to our understanding of what did and didn't work in confronting AIDS in the hope that we can avoid our mistakes in future epidemic outbreaks." —Paul Volberding, MD, Director, AIDS Research Institute, University of California San Francisco. In 1987 Volberding co-led the first study of successful treatment of HIV-infected individuals with an antiretroviral drug. "In the aftermath of cataclysmic events a witness often comes forth to tell us how it came about and point to pivotal opportunities that would have minimized its impact. Dr. Arthur Ammann, the doctor who identified the first cases of AIDS in children and the transmission of HIV by blood transfusion, is such a witness. Lethal Decisions is his highly personal account of an ongoing disaster, the global HIV epidemic in children and mothers, and the world's fatally flawed response. . . . In my opinion he is the successor to the late Elizabeth Glaser as the conscience of the pediatric HIV epidemic."